It’s been over a week since Michael struck, and we’ve been working around the clock to clean up. Final count has put us at about 280 trees down, which is certainly not ideal. We will be able to stand many trees up right again, but not all will take, so the full damage can’t be assessed for some time. Though this is the worst damage we’ve ever experienced, it’s actually going to be less detrimental to this year’s crop then Irma was. Irma hit last year in mid September when the nuts were still green. Although there was less overall damage, all the nuts were ruined. But because Michael struck when the pecans were mature and ready for harvest, there were many more knocked to the ground, but are still salvageable. We expect a decent crop this year, and will have plenty to sell. And though it’s true this year isn’t as devastating as it could have been, those fallen trees will hurt the crop for the next 5-10 years. Our day to day consists of taking a chainsaw to hanging limbs, and pulling apart the wreckage with a backhoe so we can haul it and all the other massive fallen limbs to the burn pile. The hanging limbs have to be removed before we can safely harvest, and all the extremities of the fallen trees have to be sawed off before we can try to stand those up right again. It hurts your heart to run over all those nuts on the ground with the backhoe, but limbs and fallen trees have to be moved quickly so we can get the equipment in the orchards and start harvesting. It’s a race against the clock to harvest on time. Had Michael never hit, we would’ve begun harvesting early last week. So as a result, we’re estimating having harvested pecans ready for purchase in another week at the earliest, and we’ll be sure to let y’all know as soon as we have a better idea. A fallen tree ready to be stood back up, after it’s limbs have been scalped. Acts of God occur and we do our best to carry on. A smaller crop and a few late nights hauling limbs on the back hoe isn’t too much sacrifice in the scheme of things. We’re sorry for everyone farther south who incurred so much more damage, or the poor farmers who had defoliated their cotton and unfortunately left it defenseless. 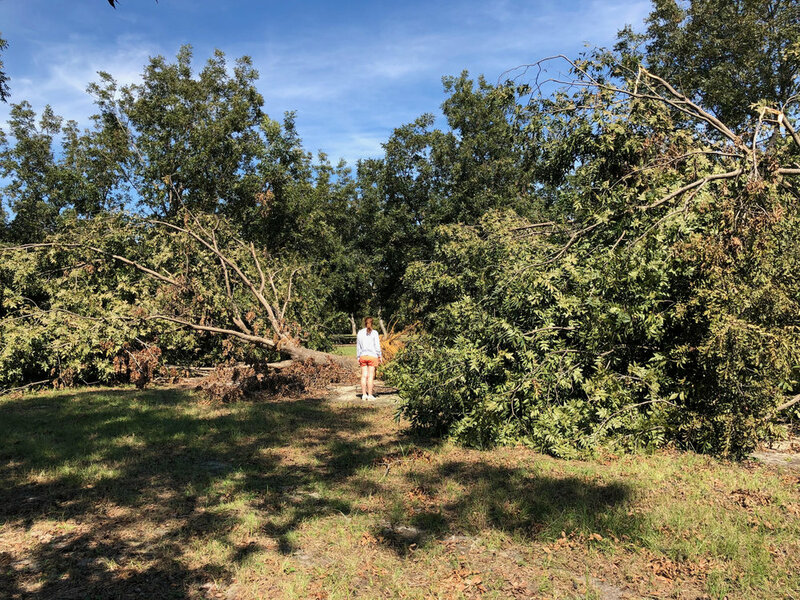 We are grateful to be safe, to have homes with power, and the ability to pick up the pieces and salvage a good season of pecans.